Data derived from in vitro preparations indicate that NMDA receptors play a critical role in synaptic plasticity in the CNS. More recently, in vivo pharmacological manipulations have suggested that an NMDA- dependent process may be involved in specific forms of behavioral plasticity. All of the work thus far has focused on the possible role of NMDA receptors in the acquisition of responses. However, there are many examples in the behavioral literature of learning-induced changes that involve the reduction or elimination of a previously acquired response. Experimental extinction is a primary example of the elimination of a learned response. Experimental extinction is well described in the behavioral literature, but has not received the same attention in the neurobiological literature. As a result, the neural mechanisms that underlie this important form of learning are not at all understood. In the present experiments, the fear-potentiated startle paradigm was employed to begin to investigate neural mechanisms of extinction. The results show that infusion of the NMDA antagonist D,L-2- amino-5-phosphonovaleric acid (AP5) into the amygdala, a limbic structure known to be important for fear conditioning, dose-dependently blocked extinction of conditioned fear. Control experiments showed that the blockade of extinction was neither the result of the permanent disruption of amygdaloid function nor the result of decreased sensitivity of the animals to the conditioned stimulus. Infusion of AP5 into the interpositus nucleus of the cerebellum, a control site, did not block extinction. Finally, intra-amygdala infusion of a selected dose of the non-NMDA antagonist 6-cyano-7-nitroquinoxaline-2,3-dione did not block extinction of conditioned fear. These results, together with a previous report from our laboratory (Miserendino et al., 1990), demonstrate the importance of the amygdala in the elaboration of conditioned fear and suggest that an NMDA-dependent process might underlie the extinction of conditioned fear. Falls WA, Miserendino MJ, Davis M. 1992. 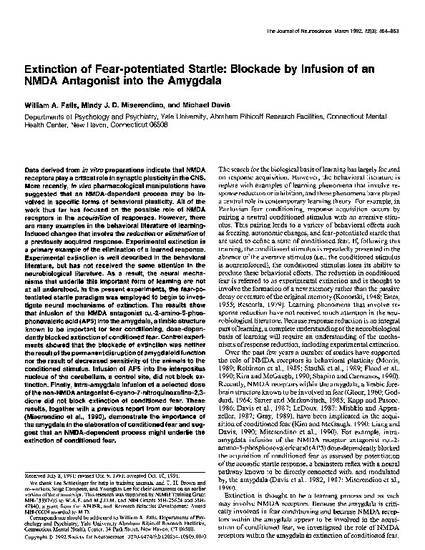 Extinction of fear-potentiated startle: Blockade by infusion of an NMDA antagonist into the amygdala. J Neurosci 12: 854–863.